Many times when people are planning to purchase a good cooking device they always get confused which one to buy. As if the brand names making the kitchenware are not enough, there are a host of appliances in the market. It is just amazing how a simple task for cooking food can take so many dimensions. The three of the most common cooking appliances you will find in the stores are the slow cooker, the rice cooker and the pressure cooker. Slow, rice or Pressure - which cooker should you choose? These are cookers that are designed mainly to allow you to cook rice while you get the rest of your dinner in place. The regular rice cookers are quite efficient in that they can cook the rice for you in 20 minutes depending on the quantity and in that time you can focus completely on the other dishes. These cookers are also good for making sticky porridges too. Besides, some rice cookers come with accessories to be used as steamers. The Slow cookers are more versatile in the foods they can cook. These cookers are mainly used to cook pre-cooked ingredients to deliver the perfect taste. Typically, if you do not want to be spending a lot of time cooking food while you can get yourself ready or take up something totally different. The slow cooking technique retains all the nutrients as well as the flavors making the final dish wholesome and tasty. The pressure cookers are the real deal when it comes to cooking food. They cook food under high pressure which allows the dishes to be cooked quickly and cooked perfectly. These are typically used to cut down the cooking times by as much as 70% while ensuring that nutrients in the food do not get destroyed. In a sense the pressure cookers can be used for complete cooking range. The best solution to this confusion would be to get the best of all three. While not many companies off this flexibility, Fagor 670040230 is just the right model for you. The pressure cooking allows two cooking levels: high at 9 psi and low at 5 psi. These are ideal for cooking grains and vegetables respectively. The slow cooking features can be used for classic dishes like roasts, stews and soups. The rice cooker will ensure perfectly cooked rice without burning or browning. The Fagor multi cooker also has important safety features like the self locking lid which ensures that you cannot open it till the pressure inside comes down to zero, the auto pressure release which ensures there is no excess pressure build up inside the cooker and dual pressure control valves to control the pressure inside. This intelligent cooker also has overheating protection and keep warm features. LED screen just makes programming this appliance a breeze and the 8 hour delay timer allows you to time your cooking to perfection. With a dishwasher safe design and stay cool handle, there are few flaws in this cooker. The only drawback though is that it operates at 9 psi when more efficient cookers operate at 15 psi. 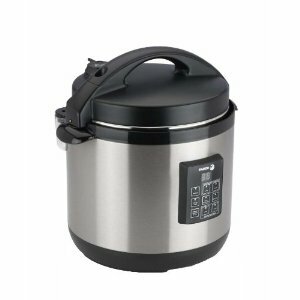 So you may not be truly exploiting the power of pressure cooking with this cooker. One more feature to be added is warm and brown feature. The brown will allow you to cook meat or soften onions without having different pan and the warm feature will keep your dish warm until it serve.